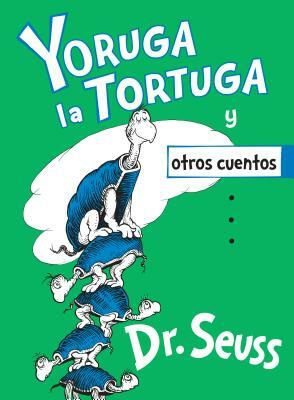 Yoruga la Tortuga y otros cuentos (Yertle the Turtle and Other Stories Spanish Edition) (Classic Seuss) (Hardcover) | River Dog Book Co.
A rhymed Spanish edition of a Dr. Seuss's story collection that teaches valuable lessons about greed, vanity, and pride—while serving up a BIG dose of humor! This collection of three modern fables by Dr. Seuss teaches valuable lessons whle providing lots of laughs! In "Yertle the Turtle," a small burp causes the downfall of a foolish king; in "Gertrude McFuzz," a bird's wish for fancy feathers has unexpected consequenses; and in "The Big Brag," a worm gets the better of a boastful rabbit and bear. Translated in rhyme and featuring Dr. Seuss's trademark illustrations, this thought-provoking collection is a great gift that will inspire conversation—and giggles!